The Cottage at Hales Hall01263 715779work01603 870304fax Self-cateringBuilt in 1478 by Sir James Hobart, Attorney General to Henry V11, The Cottage is in the grounds of a Tudor estate set in rolling south Norfolk countryside. The beams, oak panelling and lead light windows are a reflection of the history within yet the cottage is a cosy and modern holiday home with its own partly walled garden and prettily planted courtyard for evening summer suppers. With easy access to the coast, the Broads and Norwich it is a great location in a get away from it all setting. • Events: On occasion the Great Barn in the grounds of the Hall is used for wedding events but guests are welcome to stay at The Cottage if it is available. During these events the gardens are used for a short while for photography with the wedding party only. If you would like to book The Cottage during an event in the Great Barn, a discount rate is available please contact Norfolk Cottages for full details. Built in 1478 by Sir James Hobart, Attorney General to Henry V11, The Cottage is in the grounds of a Tudor estate set in rolling south Norfolk countryside. The beams, oak panelling and lead light windows are a reflection of the history within yet the cottage is a cosy and modern holiday home with its own partly walled garden and prettily planted courtyard for evening summer suppers. 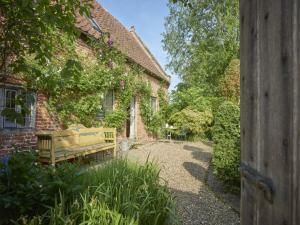 With easy access to the coast, the Broads and Norwich it is a great location in a get away from it all setting.